In a move to assert that its tough new regulations on Airbnbs and other short-term rentals can and will be enforced, the city of Santa Monica prosecuted a landlord who refused to stop renting out full units on Airbnb—and won. 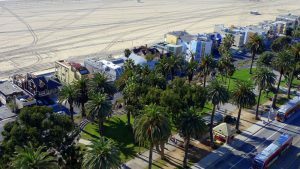 The Santa Monica Lookout reports that the man, “who boasted that Santa Monica could never enforce a 2015 crackdown on the booming business of illegal short-term vacation rentals,” was hit with misdemeanor charges of operating a business without city permits, as well as ignoring multiple citations for his violation. The rental operator, Scott Shatford, pleaded no contest (meaning he did not admit guilt) and took a plea deal. He is the first to be convicted in Santa Monica using the new rules, which were passed last May and remain some of the toughest regulations around for short-term rentals. Santa Monica has outlawed full-units that are rented for less than 30 days. Among other rules, owners are also required to stay on-site while guests rent the space. Seeing as how full-unit rentals were by far the most popular type in Santa Monica, the move was at one point predicted to slash the number of Santa Monica listings from 1,700 to just 300. Shatford was running five short-term rentals in the city that were not in compliance with the new rules, according to the Lookout. Under the terms of his plea, he will have to stop operating immediately, and, “pay the City approximately $3,500 in fines and investigative costs and pay hundreds of dollars more in criminal fines and restitution.” He was also placed on 24 months of probation. “The message is: We will enforce the law,” says a Santa Monica code enforcement officer—one of three whose job is tracking down Airbnb scofflaws. Santa Monica’s city attorney tells the Lookout that there are “numerous” court-bound cases against other operators who, like Shatford, have not heeded warnings and citations. But Shatford remains confident the city can’t feasibly replicate all the trouble they went through for him for every single person in the city who breaks the rental rules. The city of Los Angeles is still figuring out how it will regulate these rentals, but has recently gotten closer to a possible solution that would legalize and regulate short-term units.